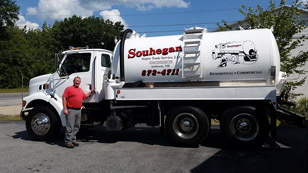 Souhegan Septic has been providing reliable, customer friendly septic service for the local area for over 30 years. In 1978 Souhegan Septic Tank Service was founded by Jack, Sr. & Carole Fedas with Jack, Sr. on the road servicing properties and Carole managing the office and phones. Through lots of hard work, the company grew. As needed Jack, Jr. would help out. In the early 90s the day came for Jack, Jr. to join the company full time, which allowed Jack, Sr. to retire. In 2003 Carole decided it was time to retire, and the business was sold to Jack, Jr. and his wife Lynn. As the new owners Jack, Jr. continued on the road servicing properties and Lynn took over for Carole overseeing the office. With new owners came some changes. A brand new Sterling truck was added, the office was computerized and the company became an LLC. Within time it became apparent that an additional truck would be needed to handle the growing demand. But one thing has not changed: the company's philosophy. As a service company Souhegan Septic Tank Service sees all customers as our most valuable asset. We instill into every employee the importance of representing our company. All customers can expect professional, courteous, friendly and efficient service at every call. Check out my interview, Tips on Septic System Repairs: Interview with Lynn Fedas of Souhegan Septic Tank Service on New Hampshire Homes, one of the top sites for Real Estate In New Hampshire, including Hillsborough, NH real estate. New Hampshire Homes also services Vermont State Homes and Connecticut For Sale. 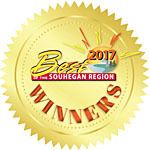 Souhegan Septic is the proud 1st Place winner of the Best of Souhegan Choice Awards every year 2007-2017. Presented by the Cabinet Press in cooperation with the Merrimack and Souhegan Valley Chambers of Commerce.